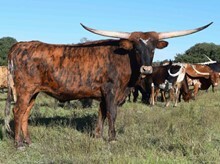 CO CHAMPAGNE is a large bodied tan brindle cow, with striking horns. She is a show stopper in the pasture. Easy to work in the chute. CHAMPAGNE is definitely one of the biggest cows in the pasture & visitors always love her. CHAMPAGNE is a big tan brindle cow that measured 70TTT on 02/16/19. And 91.5 TH! Her full sister RO CHAMPAGNE PARTY is for sale on Rocking O Longhorns for 50,000.00. Champagne has a pretty heifer calf on the ground out of the Ohlendorf's bull PLUMB LINE , that we are keeping. CHAMPAGNE is out of JP GRAND RICHY & her Dam is CO CHARDONNAY, one of the Ohlendorfs best producers! CHAMPAGNE has been in the pasture with our fantastic young bull TRANSFORMER BCR 685. He is out of RIO BRAVO ECR & REGARDED GRACE, you can't go wrong with these genetics! October 2018, AI'd to Casanova's Supermax, at Champion Genetics. CHAMPAGNE is a big, large and long bodied cow. She has a beautiful heifer at her side, that I believe will brindle like her mom.